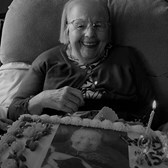 Mary Charlotte JohnsonIt is with great sadness that we announce the passing of Mary Charlotte Johnson, born April 26,1923, in Swan River, Manitoba to Edward Johnson and Elizabeth Schraeder. She was predeceased by siblings Larry, John, Leo and beloved sister Kathleen. Mary was the joy of Crofton House and loved very dearly. She is missed by all of us and will continue to live in our hearts. Services will be at Church of the Assumption Church on Saturday, December 1, 2018 at 1 pm.